We featured an office building erected on this lot in an earlier post. Here’s the house it replaced that dated back to late 1886, built by and for real estate pioneer A G Ferguson. The reason that it’s so difficult to compare the image with what’s there today is that the house was built on the sloping lot on top of a cliff, with a commanding view out over the beach towards the forests on the North Shore of Burrard Inlet. Today the site has been leveled, the cliff is no longer apparent, and the forest that remains starts a lot further up the mountains. This was numbered as 815 Hastings when it was built, but the numbers have shifted and we’ve referenced the contemporary address. On almost every document and publication that mention him he was referred to as A G Ferguson; his first name – Alfred – is never used. He was an American, born (according to his marriage certificate) in New York in 1843, and married to Marion Dixon of Michigan in Pottawattamie, Iowa, in November, 1869. He appears in the 1891 Canadian Census as Alfred Graham Fergusson, born in 1844 in the US to an English born mother and American father. In the 1901 census he was listed as Arthur, but that census collector spelled his wife’s name incorrectly, and recorded him as Fergusson. The 1901 household was completed by Elizabeth Orange, a companion, and Mabel Williams, a 24 year old domestic with James Williams, also a domestic aged 20 years. A G Ferguson came to British Columbia as a tunnel builder. He was in charge of the Cherry Creek Tunnel work about 13 miles west of Kamloops in 1884. He almost certainly arrived in Granville in 1885; he doesn’t appear in the 1885 Street Directory, but his wooden building was definitely standing at the corner of Carrall and Powell Streets in the spring of 1886, and Frank W Hart in a 1933 conversation recalled “Even in 1885, A.G. Ferguson was noted for being a C.P.R. tunnel contractor, and wealthy; a very nice man to boot. He built the Ferguson Block at the southeast corner of Carrall and Powell streets—burned down in the fire shortly afterwards”. In June 1886, within days of the fire, Mr. Ferguson confirmed he would build a ‘cottage’ high on the bluff on Hastings Street. W T Whiteway designed the replacement of his burned down office investment at Carrall and Powell; he may have designed this house as well, although as an engineer Mr. Ferguson could also have designed his own home. In 1887 he’s listed as a Civil Engineer, living on Hastings Street. By 1888 his description has changed to ‘capitalist’. When the CPR sold off land, A G Ferguson was at the front of the line. It perhaps didn’t hurt that the sale took place in the Ferguson Block, or that the CPR’s Vancouver executive, Harry Abbott, lived next door. Walter Graveley in conversation with Major Matthews in 1935 recalled the sale; “Ferguson had his hand on the handle of the door; Ferguson was first; Dr. LeFevre was second; F.C. Innes was third; then came R.G. Tatlow; C.D. Rand was next, and I was behind C.D. Rand. The first three, Ferguson, Dr. LeFevre, and Innes had sat up all night in Ferguson’s office in the same block; the Ferguson Block was the wooden block on the corner of Carrall and Powell streets, where the C.P.R. had their first offices in Vancouver; we were waiting for the C.P.R. office to open; that was why we were there; there was no rush; we just walked in when the office opened that morning; Ferguson was first; he had his hand on the handle of the door.” The speed of growth of A G’s investments can be seen in the assessed value of his property. In 1887 it was $20,000, in 1889 it was $100,000 and in 1891 it was $140,000. In that year his holdings were the sixth largest in the city. He built a series of buildings that had his name associated with them, all somewhat confusingly called ‘the Ferguson Block’ as well as the Boulder Hotel on Cordova. A G Ferguson enjoyed an active social life as well as his business and civic duties. He was an extraordinarily hands-on chair of the Parks Board, helped design the grades of the roads, and funding the Board’s works out of his own pocket when funds ran out. He was the first president of the newly formed Terminal City Club in 1899 (although the city’s merchants had been meeting together from 1892 as the Metropolitan Club). He had a luxury steam yacht, the Nagasaki (probably built in Japan). He fell ill in 1902, and died in San Francisco in 1903. Appropriately enough, today the site is home to the Terminal City Club. Perhaps the city’s most mixed-use building, it combines the club, retail uses, office space, a hotel and strata apartments in a 30 storey building designed by James Cheng and Musson Cattell Mackey completed in 1998. We looked at a building on this corner in an earlier post. It was the Merchants Building, designed by Townley and Matheson and completed in 1923. Here’s an earlier image showing the house that was replaced when the Merchants Building was developed. The picture shows the dramatic scale changes going on at the time as the frame for the Metropolitan Building was being erected next door, in 1910. The house pre-dated the century, in fact it was one of the oldest in the city. It had been built in 1887, designed by T C Sorby who also had the job of designing the first station and rail terminal. In 1891 it was occupied by H Abbott, and A G Ferguson owned the house next door (where the Metropolitan Building was built). Significant city-building was being directed from this block: Harry Abbott was superintendent of the BC Division of the CPR and Arthur Ferguson was one of the most active real estate promoters and developers in the city. Before this Mr. Abbott had, according to reports recorded by City Archivist Major Matthews, stayed in the Sunnyside Hotel on Water Street and the Burrard Hotel on Hastings. The house was built at the same time as the first Hotel Vancouver, and the lumber came from the Moodyville Mill on the north side of Burrard Inlet. Mr. Abbott’s family joined him from Brockville just before the first train arrived in Port Moody in July 1886. Apparently they travelled in his rail car a few days before the first official train, and so were technically the first passengers to travel across Canada. When the Abbott family were in residence Mrs. Abbott was said to have kept chickens in a large run in the garden. Harry Abbott came from a well-connected Montreal family – (his oldest brother was the first Canadian-born Prime Minister). He studied law, then switched to civil engineering, helping build new rail lines in eastern Canada. In 1882, aged 53, he joined the CPR, and two years later was given the job of managing the construction of the main line to the west. He was appointed to superintendent of the BC division of the railway in 1886, and spent over a decade developing the new city and expanding its services. In 1897 Mr. Abbott was still living here, but had retired from the job of running the railway’s Vancouver operation, although he was still living in the house. A year later he had moved to a new house he had built on the corner of Georgia and Jervis, and Richard Marpole, the new general superintendent moved in. One possibility is that the house had become a company owned building rather a personal one, (although Mr. Abbott was definitely owner of the lot in 1886). Another credible scenario is that Mr. Marpole bought it and lived here for 12 years before Shaughnessy Heights was ready for house construction. He moved to a new home on Angus Avenue in 1911, and it looks as if the house was vacant, and then the address disappears completely until the Merchants Building was built in the early 1920s. Here’s Vancouver new Union Station seen perhaps as early as 1917. Completed in 1916 by the Great Northern Railway, it was designed by Fred Townley. It was built for passenger trains operated to Seattle through Blaine and for the Northern Pacific Railway to Seattle by way of Mission and Sumas as well as Vancouver, Victoria & Esquimalt services into the Kootenays and Northern Washington. The Great Northern was J J Hill’s rail empire; initially he was part of the consortium behind the Canadian Pacific, but when he couldn’t get the route linked to his American network he resigned in 1883 and expanded his own system. The two-storey steel and concrete building was constructed by Grant, Smith & McDonald at a cost of $390,000. The significant expense was partly explained by the finishes: “The main waiting room will be panelled in Alaska marble, 7 ft. high, and will have marble and terrazzo floors and ornamental plaster ceiling. Provision has been made in the plastering of the end walls for placing oil paintings showing the Glacier and Yellowstone National Parks.” There were a series of other permits for additional buildings designed by Townley, adding up to over $200,000. One was the power house, located 150 feet east of the baggage room wing, with a brick stack at the east end 90 ft. high. The power house supplied heat to the different buildings through an underground reinforced concrete tunnel, steam to the passenger cars at the stub tracks, and to the passenger car yards. In connection with the passenger car yards there were a commissary building, an oil house, car repairers’ building, car foreman’s building; car cleaners’ building, a carpet cleaning building and a coal house. By the mid 1930s many of the GN Rail lines had been shut down or abandoned (including the Northern Pacific operation). Passenger service to Vancouver from Seattle lasted until 1971 when it was transferred to Amtrak. The terminal in Vancouver was demolished in 1965, ostensibly to reduce property taxes. The lot has remained vacant ever since, and is today used as a temporary parking lot and movie shoot base. It is intended to be the future home of the relocated St. Paul’s Hospital. Photo source: thanks to Arthur Babitz at The History Museum of Hood River County who sent us this image photographed by Alva Day, a resident of Hood River, Oregon, born 1887 died 1955. He took a trip to Alaska in 1917; this may have been photographed as part of the trip. See the photoblog http://historichoodriver.com/ for more Hood River images. Here’s the Bus Depot on Dunsmuir Street. It was opened in August 1947 on the former Cambie Street Grounds, sometimes used for marching practice by the regiments based in the nearby Beatty Street Drill Hall. It remained until 1993, which is around when we think our image was taken. In the later years it was branded as the Greyhound Bus Station, with Pacific Coach Lines and Maybuck Coach Lines also operating from here, but it started life as the Larwill Terminal of Pacific Stage Lines, a company created in 1922 and originally known as BC Motor Transportation Ltd., a subsidiary of the BC Electric Railway. The coach company ended up in the early 1960s being owned by the BC Government, who sold it in 1979 to Pacific Coach Lines, a new company formed by merging the Stage Lines with Vancouver Island Coach Lines. The Larwill name came from Albert Larwill, whose story we described in an earlier post. As we noted, before the 1946 lease deal that saw the bus terminal created, this was The Cambie Grounds. It was a full city block often used as an assembly area, and home to the city’s first public sporting event, a rugby match between New Westminster and Vancouver in 1887, (when the City leased the land from the CPR for $5 a year) . According to a 1943 Vancouver Sun story, a chain gang cleared the remaining trees off the lot and made it into a proper sports field. The City bought the land for $25,000 in 1902, and still own it today. Since the bus depot moved to the ‘Pacific Central’ station in 1993 the land has been used as a parking lot, often partly occupied by a movie shoot. One day some of the site might be home to a new Vancouver Art Gallery. Sometimes the Vancouver Archives have the wrong location identified on an image. This 1981 shot should win some sort of prize for being titled ‘1200 block Richards, west side’. Actually it’s the 1100 block of Seymour, showing the east side. On the corner was Buller’s Glass, dealing in windshields and sunroofs. This was almost entirely a commercial area, with a mixture of light industrial and service businesses in modest and cheaply built structures. 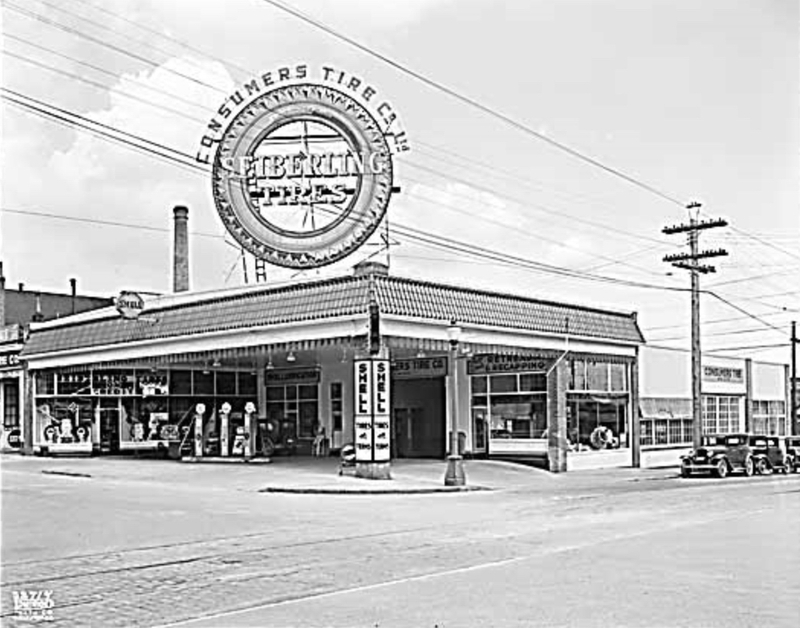 The location on the corner of Davie and Seymour looks like it had started life as a gas station, and indeed, in the mid 1950s it was home to R Holbrook’s garage, run by Ray Holbrook. In those days there were a great many automobile focused businesses around here, including parts suppliers and body shops. That was still true in the 1980s, and it was also true in earlier years: this was the location of Consumers Tire Co for over twenty years through the 1930s and 40s. In this 1937 Vancouver Public Library image the building’s original architecture can be seen, along with the huge advertisement for Seiberling Tires, an American brand owned by Frank Seiberling who had originally founded Goodyear in 1898. The building first appears in 1929, which would seem to fit in with the tiled mission style of the canopy. At the far end of the block are the Lightheart Apartments, completed in 1910 by William and Joseph Lightheart on the site of the family home and contracting business. Today this is Emery Barnes Park, named after former BC Lion, social worker and NDP MLA who was the first black politician in Canada to be elected Speaker of a Legislature. The site was acquired over several years using funds accumulated from Development Cost Levies from the surrounding market residential towers. The corner was the final, third phase of the park’s construction. In its final years the garage was used as a dry cleaning establishment, so the potential for pollution of the site was particularly high given its previous automotive uses over many decades. To the north of Emery Barnes Park there is a 1910 building which these days is called Brookland Court. It was built by two brothers, who are referred to in the architectural history books as ‘the Lightheart Brothers’. William and Joseph Lightheart were builders who designed their own developments and owned the sash widow factory that was on the site before they built the apartment building. Two other brothers are sometimes mentioned in passing as well, but there were in fact at least six different Lightheart brothers, all of whom ended up living in Vancouver and all apparently involved in construction and development. Strangely, none of the brothers seem to be mentioned in any of the contemporary biographies of worthy citizens, but at least seven of their apartment buildings are still standing today. In 1901 William and Joseph Lightheart had both recently appeared in Vancouver and both lodged with James A Johnston and his family; 25 year old William working as a builder and his 23 year old brother Joseph as a carpenter. They appear in the 1901 City Directory at 604 Hamilton Street, which presumably was their works yard. Their family roots were in Nottawasaga, Simcoe in Ontario, (on Lake Huron). 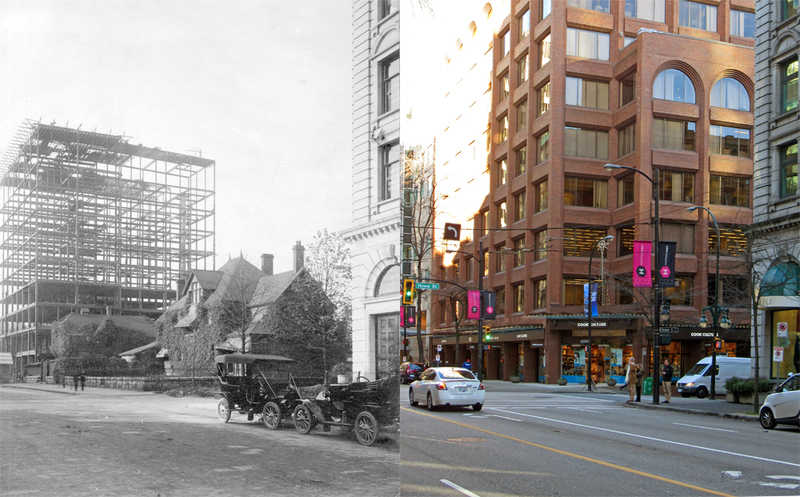 In 1901 William built a house on Burrard Street and in 1902 he built a house for George Whatmore on 8th Avenue. Joseph built a house in the same year on Burrard Street for himself, and it was a substantial house too – it cost $2,200. There’s a period where the city’s building permits have been lost, so we don’t know for certain that this building is their first major investment, but it looks to be so. William’s wedding in Escondido in 1906 was mentioned in the Daily World, as was George’s wedding in 1907. Various house-building projects were noted by several of the brothers. In 1911 advertisements started to appear for the newly completed Lightheart Apartments, offering both furnished and unfurnished rooms. In the 1950s the building was known as the Hollywood Apartments. At some point an additional floor was added, and in in 1989 major renovations were carried out that reduced the number of units to 86 self-contained apartments of non-market housing. The façade still standing today was designed by Emil Guenther, and for five years (including in our picture) all that was visible was a three storey façade and the side wall propped up with steel bracing after a fire destroyed the building in 2000. Given the ferocity of the fire, it’s remarkable that the front of the building stayed standing. The Heritage Statement still describes it as a propped façade, but that’s very outdated as in 2008 a new development was completed along with the adjacent Grand Hotel to restore the retail use and add condos on the upper floors (and two additional floors set back from the heritage element). The Grand was an earlier building, dating back to 1889, and the owner, Thomas J Roberts, was killed in while attending a card game in 1918, as we noted in an earlier post. The owner of the new Terminus Hotel when it was built was William Rees Jones; one of six people called William Jones in the city in 1901. He was either born in England into a Welsh family (1901 census) or in Wales (1891 census), and he had arrived in Canada in 1858 when he would have been aged about 15. He was running the Terminus from 1890, buying it from Bill Blair. William Blair was from Maine, and he appears in very early Granville (pre Vancouver) street directories; the first we’ve found him in was in 1882 when he was running the Deighton House, built by ‘Gassy Jack’ many years earlier. Before he arrived in Granville he was in Victoria from 1877. Around 1884 he’d moved up the street to run a saloon at this location, with Blair’s Hall at the back, where dances, meetings (and church services) were held. After he sold the bar, Blair became a general contractor. In October 1901 the replacement building for the Terminus was announced. The original hotel and saloon weren’t torn down; rather, they were moved to the rear of the site (which hadn’t been redeveloped as a hall after the fire) to clear the space at the front for the new structure. In what reads suspiciously like an ‘advertorial’ – but which was typical of the day for the thoroughness of the description, the Vancouver Daily Work of 22 March 1902 announced the completion: “On the Site of a Pioneer Water Street Hotel Rises a Complete Up-to-date Structure. Many people thought that the lot on which the Terminus hotel stood could not be made useable for a hotel. It was enclosed between high buildings on either side and the light was shut off. Since the days when Vancouver was a baby the Terminus had been there. It was one of the first hotels that reared itself phoenix – like above the ashes, and Mr. William, Jones hated to change the locality. He therefore decided that once again the house should arise, and he entrusted the work of making the plans to Emil B. Guenther. The result is that there stands today one of the most complete hostelries in Vancouver on the site of what was the old Terminus. The building has a brick front with stone finishings, with a series of bow windows on the front that give a view direct across the Inlet from the front and also a view each way east and west. The general contractor for the building was E. Cook, the well known contractor, whose foreman on the contract was George W. Maynard. The sub – contractors were: (including heaters in bar for hot water. Cope & Frey; heating, hot water, Leek & Co.; for fixtures, Robertson and Hackett: plumbing. W. Brown; painting. H. Miller; furnishing, Chas. Hach; bedding, Pioneer Mattress Factory, R. F. Campbell, manager. This suggests Mr. Jones might have been a really ‘old timer’ in the city. There are hints of this elsewhere – a reference in the Archives notes of Major Matthews to “Dissolution of Partnership between William Jones and John Thomas (“Navvy Jack” Thomas – another Welshman), and “Partnership Notice” between William Jones and Joseph Mannion, published in Mainland Guardian, 5 April 1873.” Indeed, looking for references to “Billy Jones” reveals more references to his early saloon, next door to the Granville House Hotel (which he had originally partnered with Mannion to acquire from Ebenezer Brown). In 1874 he was in partnership with Mannion. Despite this we haven’t found any early directory references to William (or Billy) Jones in Granville. At least one interviewee thought he was an American. The first reference to the Terminus is in 1889 when Bill Blair was proprietor before William Jones bought it a year later. 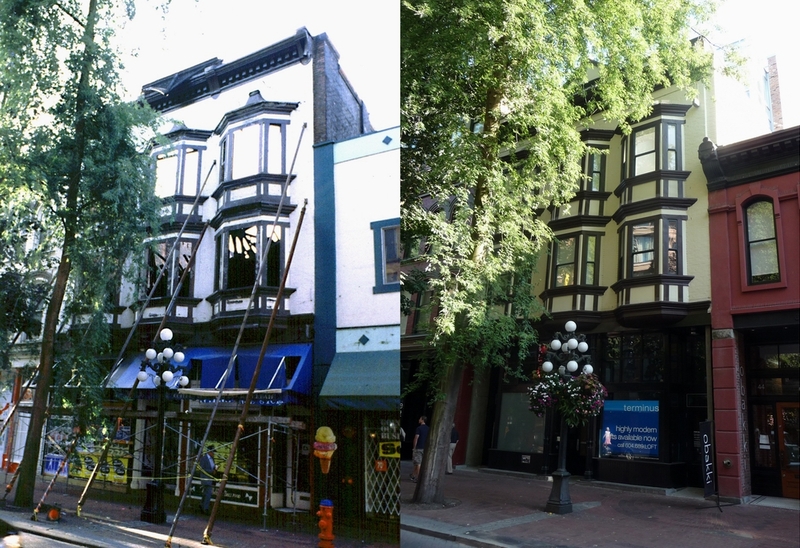 We have no idea what William Jones – assuming it’s the same William Jones – did between the mid 1870s and buying the saloon in 1890, but he wasn’t in Granville/Vancouver. In February 1908 the hotel was mentioned several times when a patron was stabbed. In 1909 the hotel, with 33 rooms, was offered for sale again. Leased at $250 a month, it was offered for sale at $33,000. The licensee, George Patton, was in court later that year, accused of allowing gambling on the premises. The attempts to sell the property don’t seem to have been successful, or Mr Jones had second thoughts as W Jones, was still the owner in 1912 when he had R H Atkinson design an alteration to the store here. The 1911 street directory shows that he wasn’t running the hotel by then; that was R Fiddler and James Thompson. Thompson had run the hotel on his own from 1905 (although he was mis-identified as Johnson that year), but William Jones was shown still living in the hotel, but from 1906 he was in retirement. At some point the hotel ceased offering the full hotel facilities: In 1912 it was still a hotel run by Robert Fiddes, but by 1914 it was the Terminus Rooms, run by Henry Savinar and in 1917 by H Avoca. The ethnicity of the owners changed over the years. In 1936 it was listed as the Terminus Hotel (rooms) run by G Iguchi. In 1948 the rooms were run by H Summers, and the 1955 listing was for the TERMINUS Hotel (Wong Jun Ming) rooms.